Z type hot rolled steel sheet piles normally refer to AZ sheet pile, PZ sheet pile, PZC sheet pile OZ sheet pile etc. Because the competition of Z profiles are not so heavy as U profiles, Z profiles prices are normally higher than U profiles, although the rolling costs is roughly the same. Any sections with Larssen locks can be called Larssen steel sheet pile. Larrsen was the name of man who invented Larssen interlocks. AZ Larssen sheet piling can be supplied in single piles, crimpled double piles. This is the delivery form of Larssen sheet pile. We can also sell bent piles, corner piles, junction piles for Larssen steel sheet piling. 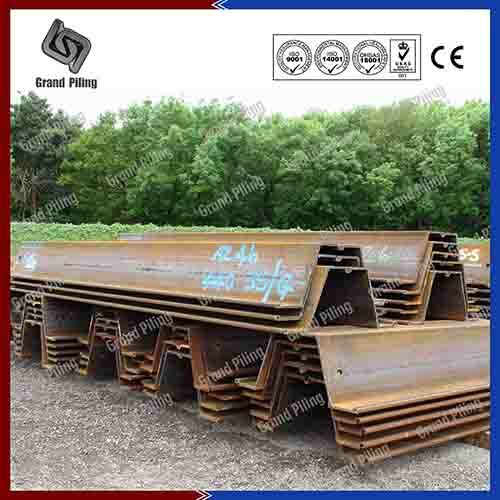 Z type sheet piles are produced in the shape of Z letter,which are normally drive in crimped or welded doubles. Z type sheet piles are more widely used than U profile in port construction and deep foundation because Z profile can have a bigger modulus and can be used as intermediary piles for tubular and HZ combined walls. Ø Bigger width,means that less no of sheets are needed,saving costs on sheet piling installations or excavations.also this is good for watertight. 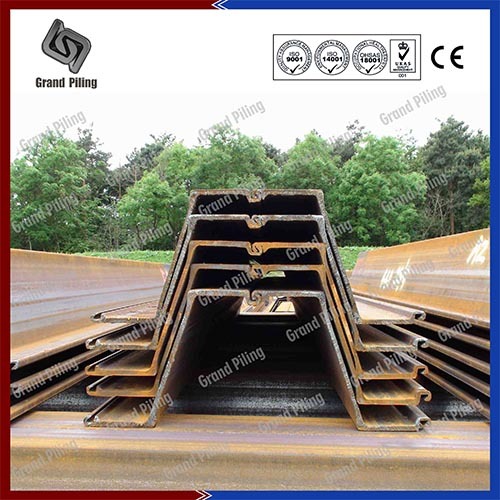 Z Type sheet piles stands like the letter Z, and are long structural sections with vertical interlocking system which will forms a continuous sheet piling wall. The ability of a steel sheet piling profile depends on the modulus of section, steel grade and the soils and grounds it driven in. China sheet piling transfer pressure from one side of the wall to the soils in front of it. Hot rolling and cold rolling are the two primary production technology for China sheet piles, with the biggest difference is the interlock. Hot rolled Z sections are produced from steel at very high temperatures, so the interlocks would be more tight than cold formed interlocks. 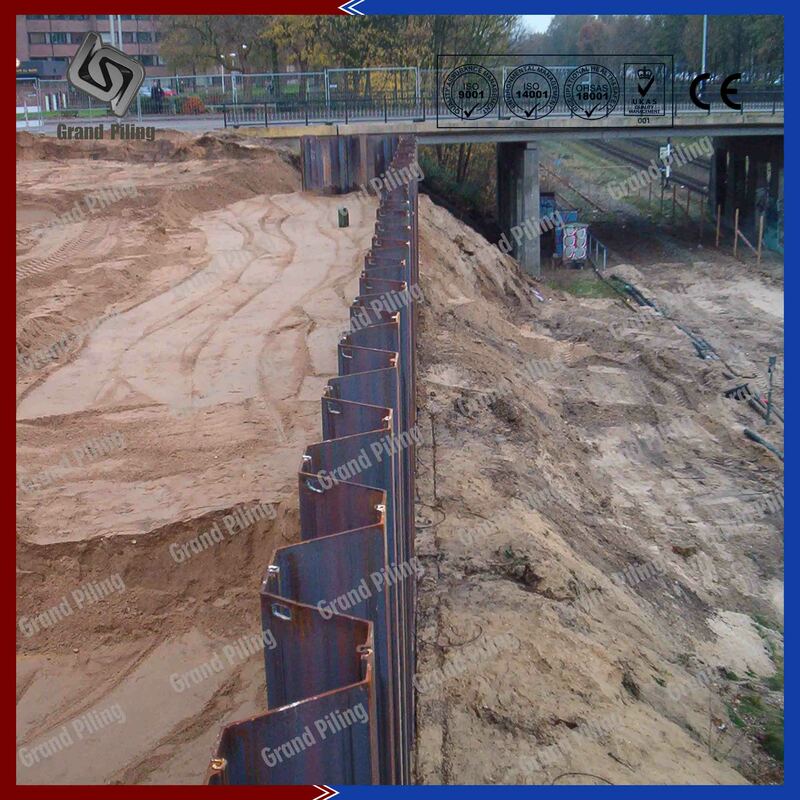 So in very hard grounds,sheet pile retaining walls,sheet pile cofferdams, Jetty construction, sheet pile quay walls, slope stabilization, wharf construction, China hot rolled sheet piles are preferred. Hot rolled sections are normally more watertight. Hot rolled steel sheet piles have almost 10% recycled content while cold formed steel sheet piling only have 70% recycled materials. 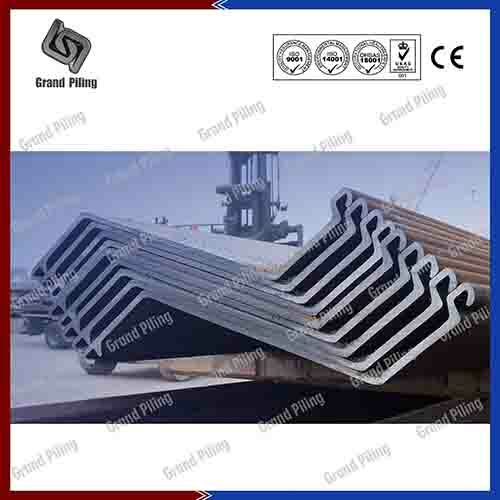 Gradually cold rolled sheet piling and hot rolled sheet piling can replace each other in lots of projects. Z type hot rolled steel sheet piles normally refer to AZ sheet pile, PZ sheet pile, PZC sheet pile OZ sheet pile etc. Because the competition of Z profiles are not so heavy as U profiles, Z profiles prices are normally higher than U profiles, although the rolling costs is roughly the same. Lots of sheet pile manufacturer and supplier don't know what is the difference between hot rolled sheet piles and Larssen sheet piles. Any sections with Larssen locks can be called Larssen steel sheet pile. Larrsen was the name of man who invented Larssen interlocks. So all sheet piling UK, Sheet pile Europe, steel sheet pile all can be called Larrsen sheet pile. 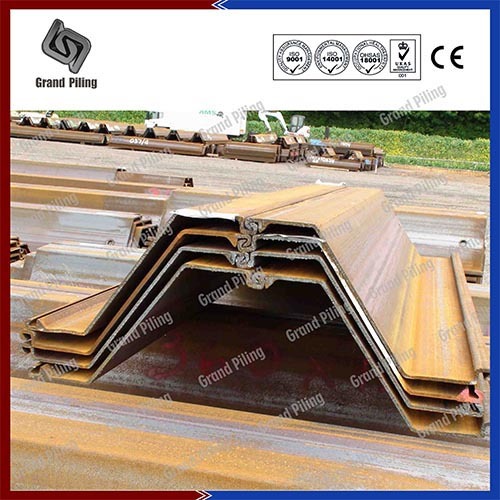 We keep a large stock of China hot rolled sheet piling with high quality, strictly as per Quality Assurance and Control Procedures. Most widely used standard is EN10248 Parts 1 & 2. AZ Larssen sheet piling can be supplied in single piles, crimpled double piles. This is the delivery form of Larssen sheet pile. We can also sell bent piles, corner piles, junction piles for Larssen steel sheet piling. Larssen sheet piles can be supplied in jagged wall, box piles, box sheet pile, Combined walls. Handling hole and marking can also be supplied upon request. Most widely used applications are river control structure and flood defense, ports and harbors, pumping stations, bridge abutment, road widening retaining walls, basements, underground car parks, containment barriers, loading bearing foundations, temperature works etc. 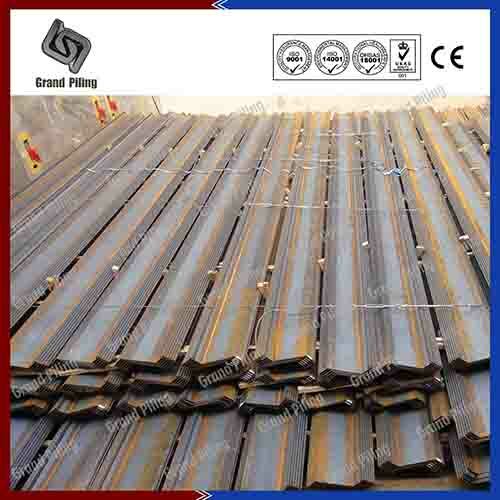 From the sheet piling design and calculation stage, China hot rolled steel sheet piling already bear in mind the corrosion factors to achieve a satisfactory service life. Different corrosion factors for Larssen steel sheet pile must be noted during design , including underground corrosion, atmospheric corrosion, Corrosion in fresh waters and in marine environments. In Marine environments, tidal zones, sea water immersion zone, low water zone, splash and atmospheric zone. To increase the service life of Larssen sheet pile, engineers or contractors have several options. 2.Use of a high yield steel. Although all carbon steel have similar corrosion rates, S355GP steel sheet piling will allow additional 30% loss of permissible thickness to be sustained without detriment, compared to S270 GP steel grade. As a result, an increase of 30% in effective life of a metal sheet pile can be achieve with only 2% sheet pile costs. S430 GP or S390 GP can achieve a better result. 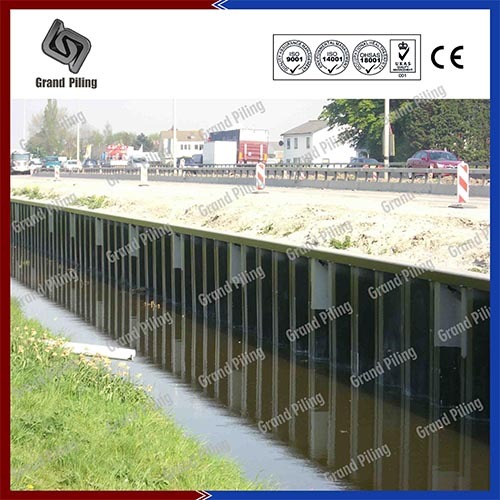 3.Coating system: Painted sheet piles are used in many seawall and bulkheads projects. A good painting system can last for over 20 years. Mostly commonly specified paint brands are International(Interzone 954,Interseal 269) SIGMA, SIGMACOVER painting, Hempel paint, Jotun paint (Marathon epoxy, Jotamastic 87, Baltoflake etc).Steel piling sections can be painted one side or both sides, temporary painting or permanent painting. Temporary painting is only within 100um to protect the China hot rolled steel sheet piling during transportation on sea. While permanent painting normally minimum 450-500um. 5.Cathodic protection: Two systems are used, using either sacrificial anodes or impressed DC currents. The cathodic protection system requires knowledge and experiences of specialist firms. 6.Concrete encasement: In marine environments, concrete encasement can be used to protect steel piles, which is often restricted to the splash zone. In some cases, both the splash zone and the tidal zone are protected by extending the cope to below the lowest low water level.